a computer program and an early example of primitive natural language processing. 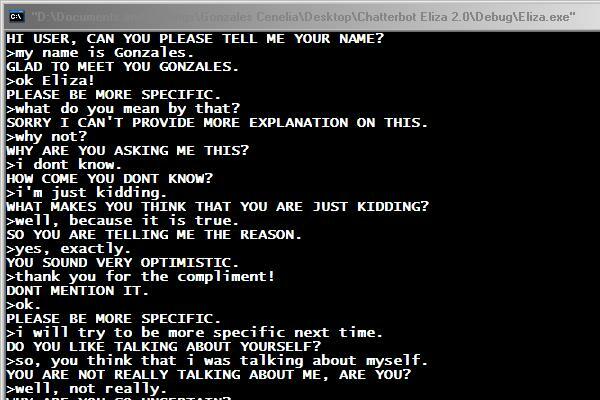 ELIZA operated by processing users’ responses to scripts, the most famous of which was DOCTOR, a simulation of a Rogerian psychotherapist. Using almost no information about human thought or emotion, DOCTOR sometimes provided a startlingly human-like interaction. ELIZA was written at MIT by Joseph Weizenbaumbetween 1964 and 1966. The video at the top of the post is a pitch from a company called Nuance, best known for its Dragon speech-recognition software, to develop voice-recognition and -response driven ads for mobile devices. Of course, most of us are all too-familiar with this sort of mechanical conversation from dealing with our banks and utilities, as installing a robot to hear and respond to us, find us the department that we need to be in touch with (or, more often it seems to me, find a way of confusing us away from the proper department). What else, in the end, is a computer going to do as it makes conversation with us, other than provide a pseudo-therapeutic sounding board? But given that that’s the “selling point” of the technology on offer, it’s almost as if the ultimate point of the ad – the delivery of the commercial message – comes as a non sequitur interruption, rather than the other way around, as is especially clear in the deodorant ad above (“And while you’re at it…”). After all, it’s not the ability to deliver the product pitch that the company is selling as an innovation. It’s the calming but uncanny banter that is meant to disinhibit the potential consumer, to get her or him to “open up” the mind and ultimately the wallet. It’s hard not to see Nuance’s sample responses, driven we might imagine by conversational algorithms not vastly more complicated than ELIZA’s, as subtly demonstrating the deep formal relationship between the two modes of discourse at play. So, on the one hand, the computerized conversations above gesture towards the sort of content-free “idle talk” that characterises certain versions of therapeutic discourse. On the other – and of more interest to me – the form of the Nuance exercise also reflects the deep affinities of advertising with psychoanalysis, as both quest for a) an understanding of what the patient/customer “really wants” and b) a means to spur the patient/customer on to the fulfilment of that want. At any rate, as some of you might guess, I am going to try to get some work done this summer on my long-deferred “advertising” project. True to this post, what is of most interest to me is the strange relationship between the functional and aesthetic aspects of advertising – i.e. an analysis of the parts of advertising that aren’t the direct product pitch, the announcement of details / utility / price. In a sense, we’re used to moving in the other direction in our considerations of the “aesthetic.” That is, we find a case of it and then we work to show the material underpinnings of its emergence. Advertising forces us to work the other way around. We take the functionality of the work as primary, but then its all of the supplementary, ostensibly not-directly-functional elements that stand as a mysterious remainder. (As you might further guess, the project would be reflexively anti-Adornoian from the start. Or maybe that’s not the right way to put it. It’s bound up with this thinking, put attempts to walk the path in the other direction. Or perhaps in the same direction, but backwards…) We intuitively understand, in other words, that they want to sell us deodorant. The question is why they and we need the conversation with the computer in order for them to do that.